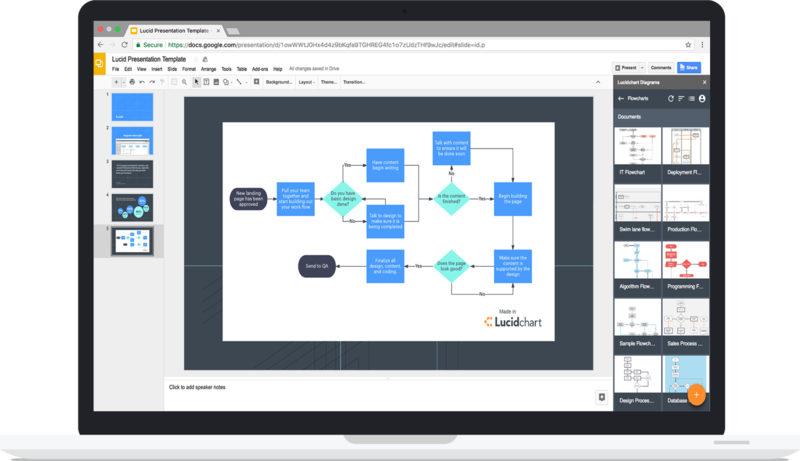 Lucidchart’s integration with Google Slides makes it easy to present your diagram with all its necessary context—an integration that will allow you to not only visually display your diagram but to tell its story as well. When you present the full view of your diagram, it’s easy for people to lose focus and get ahead of your explanation. With Google Slides, you can break down your diagram into separate pieces. Maintain control over the conversation by helping your audience stay hyperfocused on the specific part of the diagram you are walking through at that moment. Make it easy for your audience to understand your diagram and its story. Zoom in on important aspects of your diagram and create separate slides for each view. Include text, color, arrows, and whatever else you need to add color and context to speak to the non-flowchart user—all without affecting your original document. Don’t limit yourself to Google Slides. 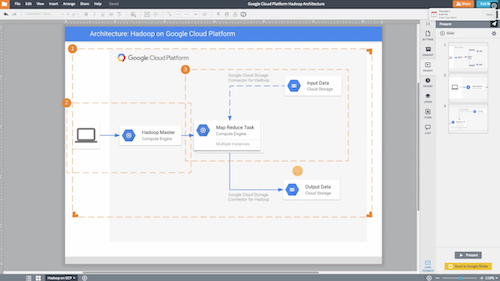 Use Lucidchart with the entire G Suite. Add professional diagrams to any text-heavy document to promote understanding and improve comprehension. Create your presentation using our Presentation Mode feature. Select “Send to Google Slides” button. Wait for the presentation to be exported. Click “Edit it now!” to be directed to your Google Slides presentation. If you don’t have a Lucidchart account, sign up to use this integration. 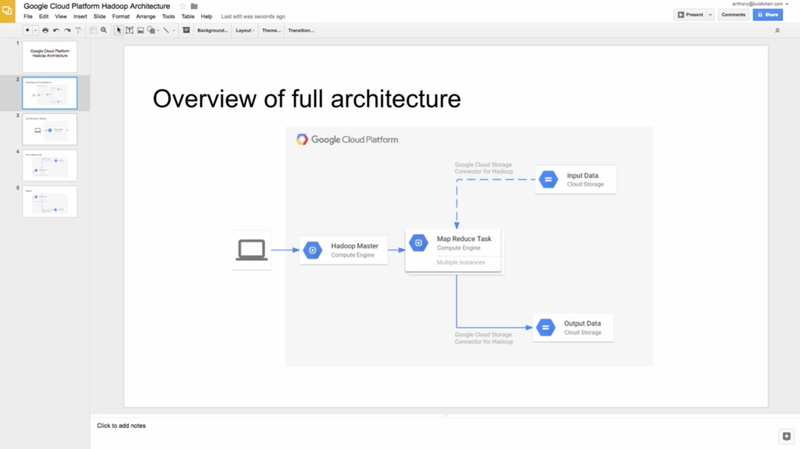 Set up the Lucidchart add-on to insert diagrams directly into your slides without ever leaving your favorite Google app! Select Add-ons > Get Add-ons. Search for and select Lucidchart. Grant permission to share basic information with these apps. 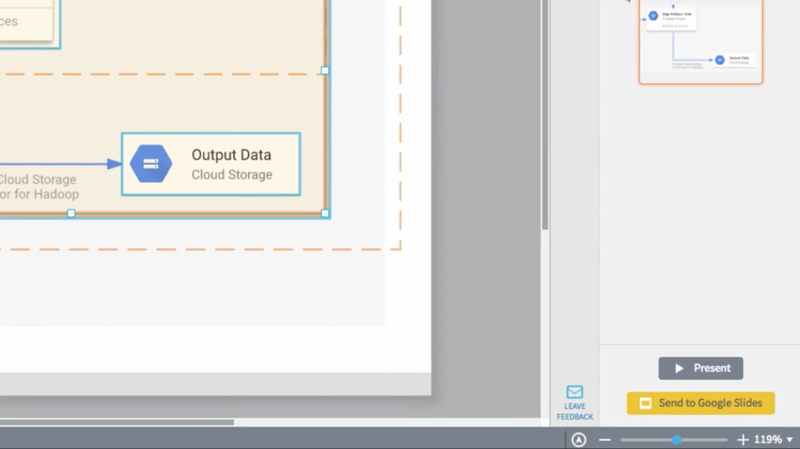 Now you’ll see the Lucidchart Diagrams sidebar in your document. Click “Sign in with Google” to grant Google Drive access to Lucidchart or to register for a Lucidchart account.